Joe Wright’s Pan is a kiss and a miss. Wright gives all of his films a kiss of beauty, and Pan is no exception: it’s paint-on-screen from gorgeous London rooftops and cityscapes to starry night backdrops and Neverlandian sunrises unmatched. But then he missed…well a followable plot. It opens with an explanation in narration that this is a set up, a prequel, pre-Pan the backstory. Audiences most likely presupposed that this film would stray from the beloved J.M. Barrie novels, but not to this degree of confusion. Sadly, this one poses too many questions then fails to answer them. Is Pan the one? Who is good vs who is evil? Matrix and monomyth connections ensue, and it’s just too much. Too many cooks in the kitchen, as they say. Too many swirling ideas. Too many supernatural cards in play. Blake Snyder calls this “Double Mumbo Jumbo.” The storyline pours in in irreconcilable duos: grief over dead parents AND kidnapped by pirates, fear of heights AND space travel, belief in fairies AND eternal life. In London, the boys battle BOTH the hard knock life of orphan-hood under a Trunchbull of a keeper AND World War II bombings. The Keeper has a special hatred for Peter, which is never explained, nor is her relationship with pirates when she suddenly summons them with her raised pirate flag. These themes of kidnapping, death, and slavery, as well as long scenes of violence make this film far too dark for its target audience: small children. It takes deep, pendulous swings from death and fear into pirate hijinks AND a quirky trampoline UFC fighting. Odd duos. Small Peter, played by Levi Miller, was lovely and vulnerable as a young Pan, but lacked the sass and strong will that Pan is known for. His deathly fear of heights was also a plot twists for the age-old flying Pan ideal. Sky pirate, Blackbeard, kidnaps slaves from around the world to work in the mines of Neverland hunting for the precious pixie rock dust, “Pixum.” We later assume, though it is unclear, that “Pixum” is both the key to flight AND long life. Pan leans on far too many assumptions. It plays like a hero journey outline with whole sections stolen from other films and some unfinished Polar Express-esque graphics spliced in. It’s basically Star Wars, but it made me want to go home and watch Hook with Robin Williams. This Hook is a pretty good guy, Pan’s ally. 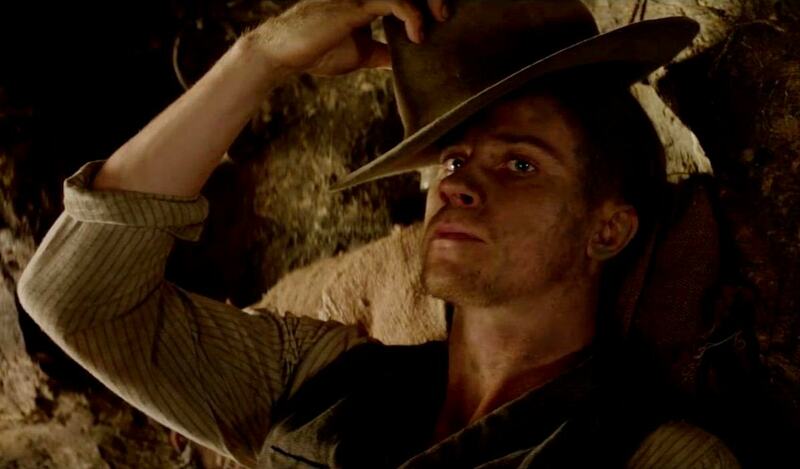 Though cold and put-offish, (Garrett Hedlund’s hard cowboy pirate accent didn’t help…it was irksome at best), James Hook is also an anomaly as the only 20-something male model working the mines. He becomes Han Solo swooping in on his ship to rescue and woo princess Tiger Lily and save the day by helping the boy Pan meet his destiny. Huh? Tiger Lily is the Princess Leia type. She sassy and cause-driven. She can fight, and she bravely stands up against the man in black after watching him kill her family members. Despite the script, Rooney Mara almost saves this film as she underplays Tiger Lily bringing the only subtlety and therefore believable balance to a gentle Peter waiting to become the Pan. The “score” exemplifies the film’s bipolar trends. Classic orchestrated film score turns rock opera upon arrival in Neverland as the whole cavernous mountain area filled with mining boys and old men pirates sing Nirvanva’s “Smells like Teen Spirit.” Hugh Jackman makes his Blackbeard entrance singing “Here we are now, entertain us.” It all could have perhaps worked had this effort repeated itself like in A Knights Tale or in Moulin Rouge, or had they not gone to such lengths to set the film in WWII decades before Nirvana fans tripped similarly into their own Neverlands. New Look, New… Technical Difficulties?